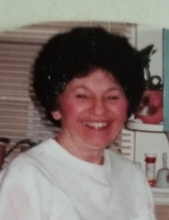 Mary Marie Davenport, 92, passed away on Monday, April 8, 2019. She was born in Gum Neck, NC to the late Henry and Jessie Dough Sawyer. Mary was an asset to her friends and neighbors; she was always willing to help others. She was an avid seamstress, and loved making clothes. She is survived by three daughters, Brenda Joyce DuLong, Esther Davenport Griffin and Lisa Darlene Carroll; two sons, Walter E. Davenport, Jr. and Gary Stephen Davenport; six grandchildren, Dennis Christopher Whatley, Todd Brandon Edelstein, Amy O’Neil Griffin, Wayne Alan Griffin II, Tiffany Nicole Davenport and Gary Stephen Davenport II; four great grandchildren, MaKenzie Taylor Howard, Kamron Mark Sawyer and Kylie Grace Sawyer and Poppy S. Griffin. A memorial service will be held at 1 PM, Monday, April 15, 2019 in Deep Creek Baptist Church 250 Mill Creek Pkwy, Chesapeake, VA 23323 by Rev. Larry Ryals. Burial was private in Meadowbrook Memorial Gardens, Suffolk, VA. Memorials may be made to Gideons International. Sturtevant Funeral Home, Portsmouth Blvd. Chapel assisted the family with arrangements. To send flowers or a remembrance gift to the family of Mary Marie Davenport, please visit our Tribute Store. "Email Address" would like to share the life celebration of Mary Marie Davenport. Click on the "link" to go to share a favorite memory or leave a condolence message for the family.